the image of this silk kindly donated by John Sykes, UK. This well known glebe house, situated close to Macclesfield was built in 1472 and survives very little changed from the time of its erection. A peerless half-timbered house - full of romance, full of history, charged with an old-world atmosphere - Gawsworth Old Rectory lies in peaceful seclusion in rural Cheshire. Once the home of Mary Fitton - the supposed 'Dark Lady' of Shakespeare's sonnets - this building, unique among all other parsonage houses, in company with medieval church and Old Hall, attracts visitors from all parts of the world. 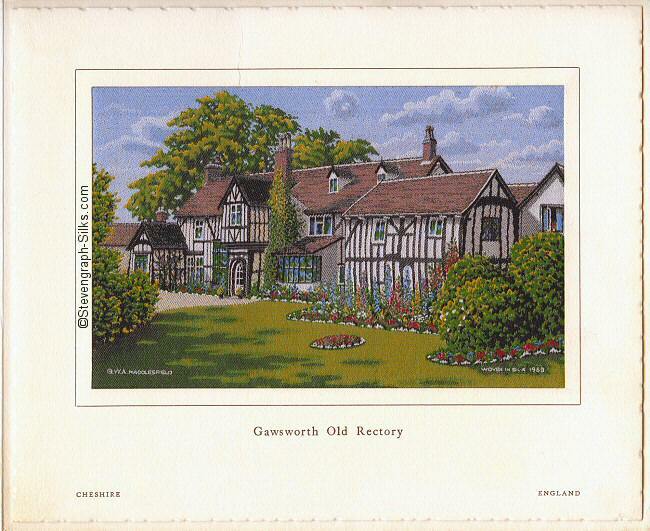 The picture for 1963 was GAWSWORTH OLD RECTORY, a well known glebe house, situated close to Macclesfield. Built in 1472 it survives very little changed from the time of its erection.